Getting a real Christmas tree is by far one of my favorite traditions that J and I have established since we moved to Kalamazoo a little over six years ago. For many years, we drove down to Vicksburg to get our trees from Mott’s Christmas Barn. Well, they had a little issue this year with deer eating the trees and they were forced to closed. We had to find a new place to pick up a tree. We decided to go with Gull Meadow Farms in Richland. They don’t cut their own trees, but instead they partner with a farm nearby. They just use the farm to sell the trees with the added bonus of a light show, bakery treats and, on weekends, a free visit with a really great Santa. Santa didn’t come to Gull Meadow until 5:00 on the Friday night we went to get our tree. That’s a little late for us because bedtime for L is usually around 7:00. We decided to grab dinner on our way to Richland and, if you’ve been paying attention, make this our first restaurant trip as a family of four. We started heading east on Gull Road toward Richland because there was a restaurant that recently opened that I was excited to try. 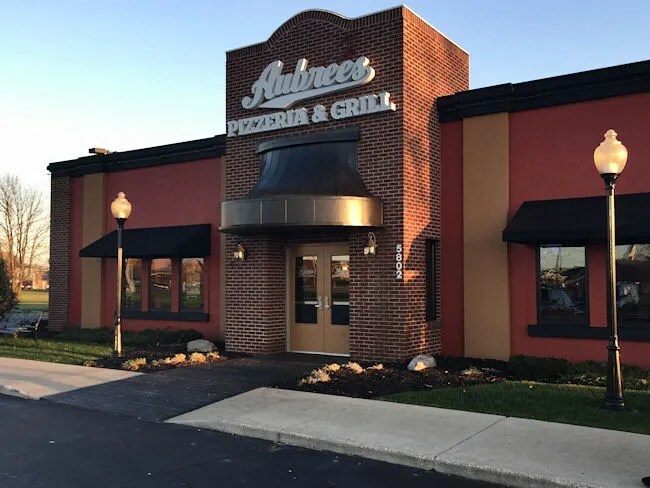 Aubree’s Pizzeria & Grill opened in Septe in the building that previously housed Bennigan’s on Gull Road in front of Meijer. The small Michigan chain has only nine other locations with all but one being on the east side of the state. There’s also one in the works in Plainwell in the old Big Boy right off the highway. The roots of the chain trace back to the early ’70’s when the original bar that launched the chain was opened in Ypsilanti. The Kalamazoo store looks a lot like most chain restaurants…which makes sense considering they moved in to one. We only ate at the Bennigan’s once, so I can’t actually comment on how much work was done to the place when Aubree’s came in. It still has the feel of a chain restaurant by the color pallet seems a little brighter than I remember. They also have a bunch of blank picture frames throughout the restaurant they are hoping to fill with pictures of local athletes. You can find out more information about that here. We walked in to Aubree’s right around 4:30 on a Friday night. There were already more people than we expected when we got there. We were taken to a booth right off of the bar in an area that was empty when we got there. They brought us one of those car seat slings to put B (he’s the newest addition to our family) in while we ate. The booths were tight. Like really tight. We’re not huge people, but we’re not size one’s either. We squeezed in and L crawled in beside me. I grabbed the drink menu off the table and looked for a craft selection. They had a list of breweries but no actual list of beers. I didn’t feel like asking because that doesn’t usually go well, so I skipped it an ordered a Pepsi instead. Aubree’s is kind of known for their pizza but we all chose something else. We’ll do the pizza at a later date. Probably when the Plainwell one opens and we’ll order carry-out from there. I did something called the Old Detroiter Burger. The meat is hand pattied fresh ground chuck. 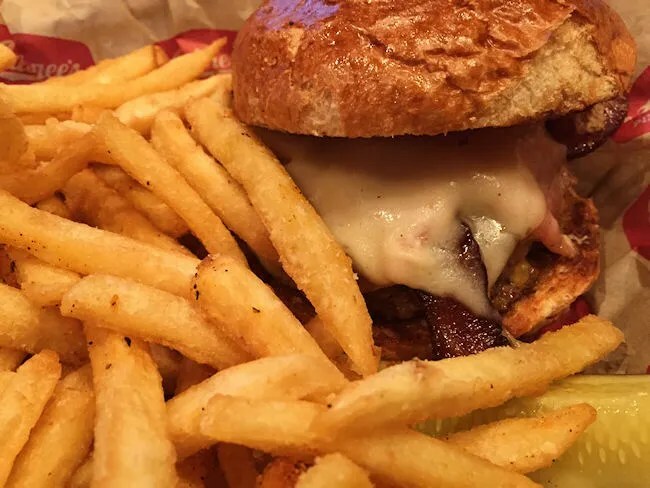 A 1/3 of a pound is topped with Bavarian ham, Applewood smoked bacon, and Swiss cheese. This sandwich was really good. The meat was very juicy with a slightly pink center. It had that loose pack of meat that only comes from the hand pattied meat. The sandwich was a little on the salty side with both bacon and ham, but it was not an overpowering saltiness. It was a delicious saltiness that held together with the Swiss cheese. The sandwich came with choice of side. I opted for the thin-cut seasoned fries. They are pretty much what they sound like. Thin cut restaurant style fries with a Cajun like seasoning on them. Both J and L went for a Mac ‘n Cheese. L ordered off the Kids menu. That Macaroni and Cheese is very similar to the adult version. It’s a smaller portion of spiral pasta in a “creamy sauce” which I believe is some kind of white cheddar sauce. 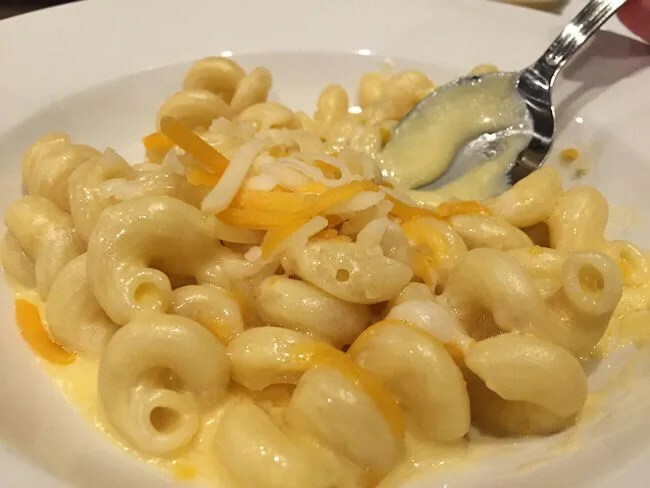 The kids portion is topped with shredded cheese and served with choice of a side. L chose the applesauce which comes in a cup. J went for the Smokehouse Mac & Cheese. 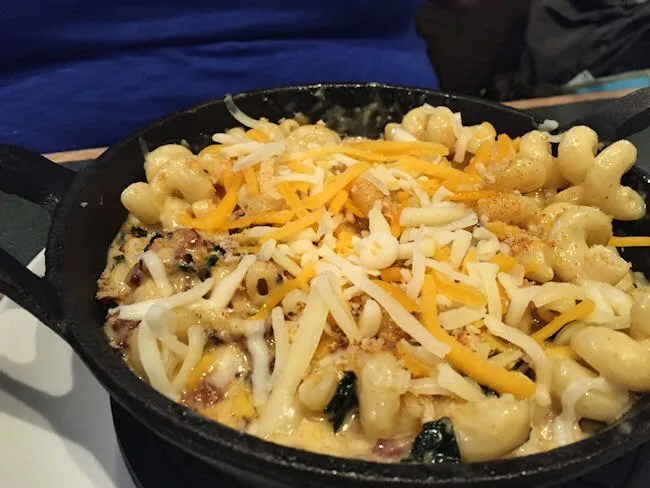 This portion of mac & cheese comes with Applewood smoked bacon and sautéed Kale tossed in with the spiral pasta and the creamy sharp white cheddar sauce. J really liked this pasta and was a little reluctant to share because it was so good. She wanted some to take home for later, which she did, even though I stole a few bites. Our waitress came back and asked about dessert which really got L’s attention, but we were heading out to get our Christmas tree and we convinced her we’d get a cookie at the farm for dessert. The bill for our meal ran just over $35 before tip. It was a total success on all accounts. B slept through his first restaurant meal, the food was delicious and it was much better than expected from a chain restaurant. 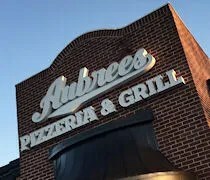 Aubree’s Pizzeria & Grill is just starting to make it’s mark on this side of the state. I don’t know if there are more expansion plans or not, but we would definitely welcome one on the West side of Kalamazoo. This location is a little far for us just for a night out type of meal, but I can say, when we drove back by after getting our tree, the parking lot was packed. It seems like they’re doing well and it’s easy to see why….and we haven’t even tried the pizza yet!